The BCM-1601 Bearing Condition Monitor is designed to be a cost effective solution to measure the temperature and vibration levels of mission critical installations. Both the temperature and vibration indicators are fully programmable as far as range, alarm and signal re-transmit are concerned. 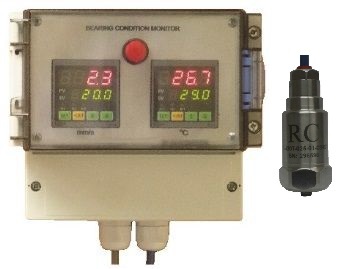 The RC420-T sensing unit integrates vibration and temperature sensors in one stainless steel housing and the M8 mounting stud ensures a secure connection to the equipment. Local display of vibration level, temperature and alarm make it easy for operators and inspectors to determine the condition of the equipment being monitored.